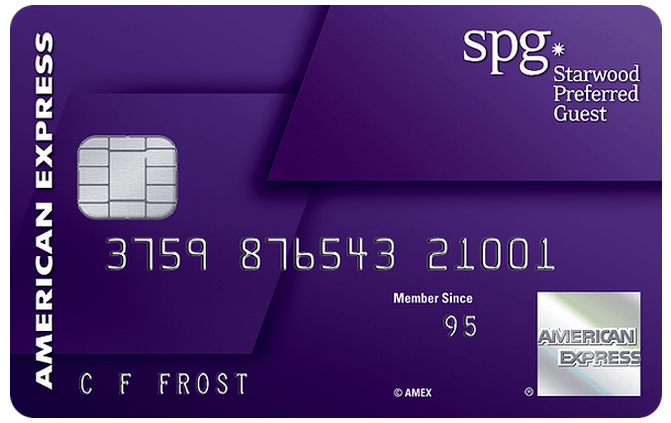 High credit card reward : While this card is $ 1 Brush get 1 point, but due to the widespread use SPG points, exchange high-value hotel, exchange air miles (1.6c) up to 1: 1.25, the credit card rate of return equivalent to 2% the above. This ratio is generally 1% cash back credit card is better. Amount to high : AMEX for customers are very generous, often higher than other banks give more credit. Three times the amount raised : AMEX card in the first 61 days after the cardholder can go to three times the original amount of increase through the official website. Valuable : in-house can be achieved by 2c + (5K can be converted point average $ 100 worth of hotel SPG), may be changed to a 5C, see reservation combat . And if the hotel is set cat 3 and above, can enjoy four nights give away a given night discount. Weekend predetermined number of points need less than usual 1000. Comes the turning point discount : 2W per revolution point to the air miles (such as AA, AC, ANA), will be presented additional 5,000 miles. Equal SPG hotel consumption, the highest was 2.5 airline miles (original inn consumption 2x points * 1.25). Other consumer discretionary spending has 1.25X airline miles (originally of other consumer 1X points * 1.25). Turning Point partners can sometimes provide additional preferential turning point : for example, to turn 2W AC / AA, sending 5K points. That is 2W starpoints able to turn into points 3W AC / AA mileage. Eighteen months ago, just an understanding of the credit card, see the unknown space forum many people discuss this credit card. I did not think, go with the flow also applied for one. This choice proved how right: the amount has risen to more than 1w, nothing brush pressure (tall). The points can be saved to multiple airlines, but also to stay well (Smart). No reward for the main brush daily consumption (the Queen). I went to Disney with five points given night room, 19k points over 1000 swap out a $ value: booking combat . This card and AMEX Everyday Preferred same card can be used as the main consumer, because the consumer can be equivalent to + 2% cash back (if redeemed for hotel or airline miles, then turn into). Moreover, this card can turn into AA miles, the equivalent of $ 1 can get 1.25AA mileage than AA and citi of co-branded cards $ 1 1AA get better mileage. Card annual fee is not high, with the AMEX Offer fully able to earn it back. So, I’ve been holding this card.